This page is about the locality. For the wine region in South Australia, see Adelaide Hills wine region. 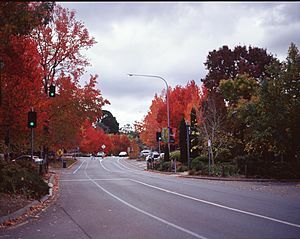 Autumn leaves typical of the Adelaide Hills. View from Forest Range through to Basket Range and on up to Marble Hill on the far ridgeline. The town of Stirling is famed for its colourful autumn landscape. A former house in Mount George inspired by Georgian architecture common in England. It was converted into a service residence for teachers in training in the 1960s. For most Adelaide residents, a drive through the hills is a popular pastime, particularly due to proximity. With Adelaide being a linear city extending 90 kilometres (56 mi) north to south, the hills are within 20 kilometres (12 mi) of the majority of residents. Other significant attractions are the cooler (up to 8 degrees) temperatures in summer, lush green and sometimes frosty winters and the picturesque old-world towns situated largely among scenic landscapes. The Mount Lofty area, home to Adelaide's television transmission towers, has a lookout area, restaurant and the fire-spotting tower that used to be run by the Country Fire Service. The area receives a light snowfall approximately once every three to four years, occasionally enough to stay on the ground for half a day. The Adelaide hills region is close enough to commute to the city, yet is the gateway to the country, so residents enjoy the best of both worlds – the country community life and the convenience of the city. Desirability of the area has increased, particularly since realignment of the road and construction of the Heysen Tunnels on the South Eastern Freeway improved road access. Rising real estate prices reflect this. The tunnels, completed in 1999 are named after Sir Hans Heysen, an eminent local landscape painter whose home and studio, "The Cedars", has been maintained as a cultural site located near Hahndorf. To this day, Hahndorf itself supports a thriving community of artists and craftspeople, either in the town or nearby countryside. The hills region is also a premier wine region within Australia and also one of the oldest. The veritable maze of valleys and sub-valleys, with slopes offering every conceivable aspect, means there is as much mesoclimatic variation as one can find anywhere in Australia, making generalisations of wine type very hazardous. The first vines were planted in the Hills in 1839, three years after South Australia was declared a province, a case of that wine was delivered to Queen Victoria in 1844. There are over 50 wineries (2005) within the Hills region which are open most days for tasting and cellar sales. The area is home to the annual Medieval Fair held at Gumeracha across one weekend every April, and the English Ale Festival, also annually held each May. Highlights of the Medieval Fair include live jousting tournaments held on horseback, blacksmithing and dance demonstrations, needlework and costume creation, and authentic music provided by wandering troubadours. The genesis and popularity of these two colourful festivals, where patrons are encouraged to come in costume, springs from the relatively large numbers of British ex-patriates who reside in the Hills. Throughout the year there are folk music sessions and concerts held in various small towns like Mt Pleasant, Mylor and Balhannah - connected with this same cultural community. Gumeracha is also home to the largest rocking horse in the world, standing at 18.3 metres (60.0 ft) (approximately the height of a six-storey building) and open to the public, it serves to advertise an adjacent wooden toy factory and wildlife park. The town of Birdwood is home to the National Motor Museum and is the endpoint of the annual Bay to Birdwood run, in which more than 1,500 vintage motor vehicles are driven by their owners from Glenelg past the city and through the hills to finish at the museum where a festival is held. The museum holds a large and historically important collection of cars, motorcycles and commercial vehicles. Sporting and recreational activities are also popular in the hills region, with sports such as Australian Rules Football, Cricket and soccer having very strong participation rates. 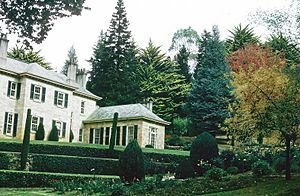 Grounds and facilities within the Hills are of good quality, with some playing grounds placed amongst the rugged beauty of the Adelaide Hills. One example of this is the Basket Range Oval (home of the Basket Range Cricket Club), which overlooks the wide sweeping hills views of the area. The Mount Lofty Botanic Gardens during autumn. View SE across the Piccadilly Valley from the Mount Lofty Scenic Route. The summit of Mount Barker, 22 km away, can be seen on the horizon. The Hills region also has many conservation parks, including the Cleland Conservation Park with its free roaming kangaroos, wallabies and emus. The park also has enclosed areas for dingos, koalas, native birds & snakes, and is a popular destination for school groups as well as international visitors. Many native species of fauna can be encountered within the hills region. Among the more common species include the kookaburra, tawny frogmouth, southern brown bandicoot, kangaroo, brown tree frog, and bearded dragon. Several of the less common species include the antechinus (Morialta Conservation Park), heath monitor (Scott Creek Conservation Park) and the very rare inland carpet python (greater Mount Barker region). Many walking trails, including a portion of the Heysen Trail and bike trails, including the start of the Mawson Trail abound within the Hills. The Heysen Trail itself extends from the tip of the Fleurieau Peninsula, through the Adelaide Hills and on up to the Flinders Ranges, three hours drive north of Adelaide. Birds found in the Hills include some of the best-known Australian parrots such as the Adelaide rosella, rainbow and musk lorikeets as well as large cockatoos like the Major Mitchell, and the yellow-tailed black cockatoo. Smaller but no less spectacular are the superb blue wren and eastern spinebill. Adelaide Hills Facts for Kids. Kiddle Encyclopedia.